Banks issue loss-absorbing contingent capital, so why not sovereigns? A Bank of England proposal to make government debt extendible in bad times would render crises easier and rarer. The system would be hard to set up today, particularly in Europe, but the idea is worth backing. 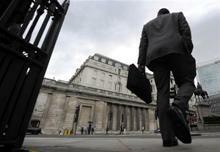 The Bank of England proposed in a paper published on Nov. 20 that sovereigns issue so-called “CoCo” bonds. Contingent convertible bonds are used by banks to absorb losses in a crisis, either by converting into equity, or writing down investors’ principal. The Bank of England’s idea, floated in its latest Financial Stability Paper, involves sovereign bonds incorporating contractual terms so that bonds are automatically extended if a country seeks a bailout.